The Skinny: Action/heist flick that's inconsequential and unimportant, but also an amusing bit of minor eighties entertainment. Andy Lau faces off against both Teddy Robin and Norman Tsui Siu-Keung in this action/heist pic from director Brandy Yuen. Lau is Charlie Chan (no, not that Charlie Chan), who's hired by a local insurance company to guard the Koran, a holy artifact which is probably not the famed Muslim religious document. 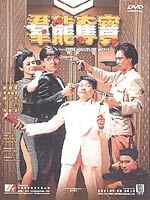 However, many factions are angling to get their hands on the Koran, including famous sharpshooter Ma (Norman Tsui) and renowned gentleman's thief Cho Fei-Fan (Teddy Robin). Assisting Cho is his daughter Sandy Lam, while Rosamund Kwan shows up as a mysterious beauty who captures Charlie Chan's eye. The script for this film is uneven and inconsequential, which is par for the course for eighties Hong Kong Cinema. Typically, the idea was to throw a passable amount of effort into the screenplay, while reserving all the major effort for the action sequences. That seems to be the case here, and director Brandy Yuen and action director Yuen Wah do their jobs quite well. The action, while filled with stunt doubles and obvious match cuts, is entertaining and probably a good enough reason for some HK Cinema fans to tune in. Particular note should be given to Teddy Robin's body double, who's obviously a few feet taller than the famed midget maven. Casting Robin as a Yoda-sized kung-fu master seems a prescient moveexcept there are probably only six people worldwide who like Teddy Robin more than Yoda. He's more annoying here than anything else, though nobody in the film turns in anything above an average performance.